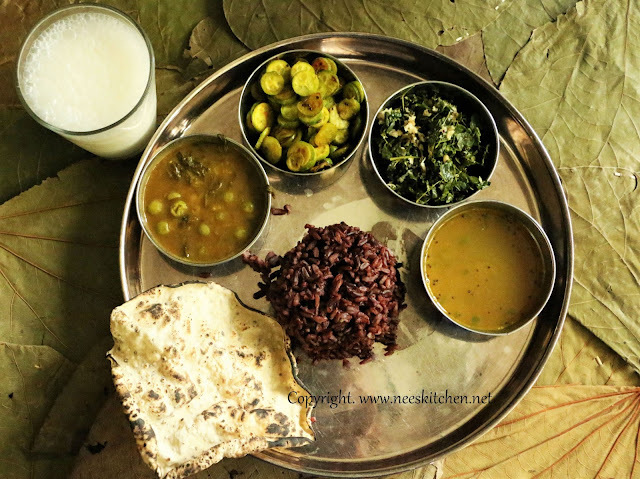 Black Rice Pulihora - Check the steps to cook black rice in electric cooker. 1. Since I cooked black rice in rice cooker, the rice need not be soaked. This can be done in parallel. 2. For the sambar, Soak dhal for 1 hour. Soak tamarind for sambar and rasam. Cut all the vegetables in parallel. 3. Make the wheatgrass juice. 4. In Parallel keep dhal and wheatgrass rasam in 2 stoves. 5. While point 4 above is cooking, cook the simple tindora fry. 4. Make the banana stem butter milk. 5. By this time, rasam and tindora fry must be finished and Dhal would have cooked. 6. Mash the dhal and cook sambar. 7. In parallel with sambar, cook murunga keerai curry. 8. Just before serving make sutta appalam. For Non - diabetic, black rice can be replaced with white rice. For diabetic black rice can be replaced with brown or red rice.